Beautiful & GLAM by Rawlins Anchor Food Professionals Anchor Mozzarella Cheese best pizza Cheese Pretzza Deeo Cheese Pizza delicious pizza Pizza Rolls PizzArt PizzBurger Rawlins Eats Rawlins GLAM Ultimeat Pizza unique pizza PizzArt Is Back Again - Better and Tastier! When it comes to food, we Malaysians are always very innovative in creating the varieties thus we have colorful apam balik and roti canai, karipap inti bihun and popia pisang [Saja Kongsi]. Also riding (and might be heading) on the bandwagon is Anchor Food Professionals (AFP) when they embarked on PizzArt campaign, last year where AFP introduced unique yet locally recognized and loved the variety of pizza such as Flower Pizza, Pizza Bombs, Adjaruli Khachapuri, Mini Muffin Pizza and Pot Pie Pizza. Under the PizzArt Campaign, AFP allows the elevation and infusion of global palette trends into local favourites. And when you think that AFP is out of their creative juice, they came up and introduced five more pizza masterpieces that are even more exciting than the last ones. So what do we have for the second PizzArt campaign? AFP introduces the meat-endowed-cheese-oozing PizzBurger, an all meat-based UltiMeat Pizza, a spin on Chicago's authentic Deep Cheese Pizza, a hearty Cheese Pretzza as well as delicately shaped Pizza Rolls. I was invited to taste the latest additions to the PizzArt campaign promotion, at least 4 out of 5 of them ie PizzBurger, Deep Cheese Pizza, Cheesy Pretzza and Pizza Rolls. So, what's my verdict for the best seller of the second edition of PizzArt campaign? Bistecca & Bistro (Sibu) - Hey this is my hometown! Yeah! We were brought to Pizza House (PJ) and U Pizzeria (Subang) to taste the pizzas. We were told by Ms Linda Tan (Director, Anchor Food Professionals) that these pizzas can only be made by kitchen crew with advanced culinary skills and in restaurants with pizza ovens thus the selection of the outlets to launch the second wave of PizzArt campaign. Before we were allowed to taste the pizzas, at each outlet, we were given a task - to see who finishes the most pizza within 3 minutes time. And each time, both outlets turned into a battlefield to see who ate the most pizza. The steaming hot Cheese Pretzza was super delicious and best eaten while it is still hot! The meat-filled Cheese Pretzza incorporates Anchor Cream Cheese, Anchor Extra Yield Cooking Cream, Anchor Mozzarella Shredded Cheese, Anchor Colby and Cheddar Cheese into a dough before it is baked and served with a side of pizza dipping sauce. But my taste buds were instantly brought to life at my very first bite of Pizza Rolls. At the size of a bite (my bite to be exact), I can finish at least 5 Pizza Rolls on my own (I think hahaha). Pizza Rolls oozes cheesiness with every bite as it's stuffed with Anchor Shredded Mozzarella Cheese, Anchor Shredded Parmesan Cheese and Anchor Colby and Cheddar Cheese and Masala meat and spinach. Can I have these amazing cuties for breakfast and snacks please? 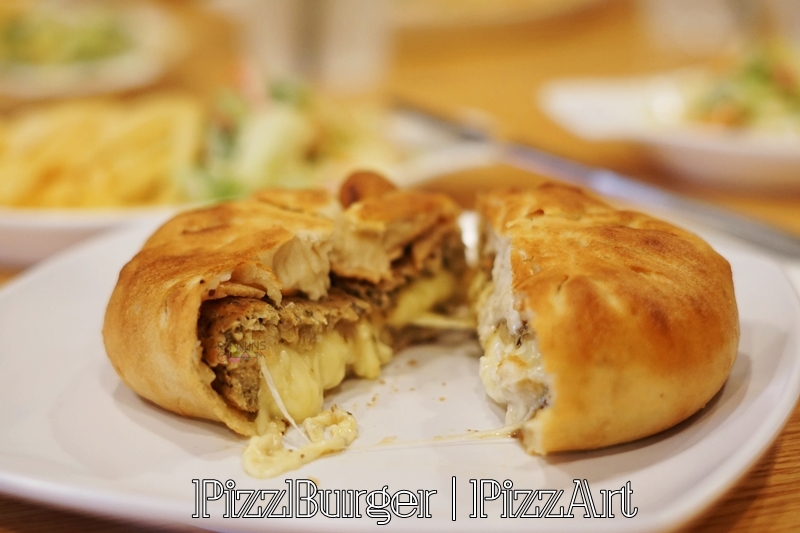 Then at the U Pizzeria, we tasted the Deep Cheese Pizza and PizzBurger. Oh My! Oh My! 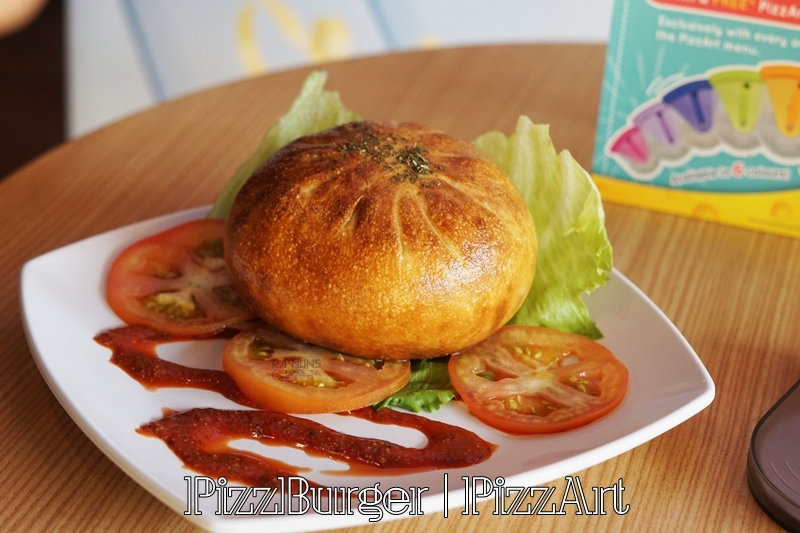 The PizzBurger comes in the shape of a large burger bun, features a succulent grilled minced meat patty stuffed with Anchor Mozzarella Shredded Cheese, Anchor Colby and Cheddar Cheese is baked in light crust with Anchor Butter. I just can't get enough of the tasty patty - I literally peeled off the crust and eat them separately because the patty was so juicy! Then came Deep Cheese Pizza. You would have thought that I have enough but no Sir, I can still eat after munching down all those pizzas! This delicious creation is Inspired from the Chicago-authentic deep dish pizza, featuring an elevated layer of stuffing filled with creamy, delicious Anchor Shredded Mozzarella Cheese, Anchor Shredded Parmesan Cheese and Anchor Colby and Cheddar Cheese with a hearty Putanesca filling. So, the next one is to haunt the outlets for Ultimeat Pizza as I was informed that it features a pizza base made entirely out of ground meat deep fried to crusty perfection before being baked with Anchor mixed cheeses on top. And with Thaipusam and Chinese New Year just around the corner, I would say that all these PizzArt pizzas are just great for the occasions - to be shared with family and friends. I am sure your loved ones will love all these unique pizzas. Ya ampunnn.. terliur pulak tengok gambar-gambar pizzArt ni. Dah lama tak makan pizza. comel- comel pizzanya..bestnya..suka tgok ekspresi wajah rawlins...happy always..
Yummy they look so tasty,I'll love these pizza during my holidays. nyummmyliciousss...terus lapar bila singgah entri ni..semua nampak sedap btw harga ok tak ? ahhhhboiiii!!! PizzArt nampak sangat sedap la! cinda belum try before, tapi tertaggih kat Cheese Pretzza!! Wawww..kreatif menu.. tapi jauhlah..kalau dekat dah pegi taw. macam-macam gaya pizza ada, kreatif betul. mesti sedap semua tu. Wow its totally pizza + art in their menu. So creative! I wonder how much it cost..
Argh, I can actually feel the stringy cheese on my tongue now, reading this post. Was at a PizzArt pizza trail in Ipoh just yesterday! Wow! I really love pizza or let's say I am obsessed in pizza. lol!! Those unique and delicious looking pizza are must try. I really love it. Who says pizza can be made flat only?! How cool to have this pizzart campaign, makes you creative and learn new recipes. Walawei mana boleh jadi ni, mesti nak kena jamah juga nanti nih. Lain kali time lunch tak nak baca bab makanan lah, mau kopak poket dibuatnya angkara mata. wah....hanya mampu tengok jer la, sebab sekarang tengah misi kuruskan badan dan kawal kalori. betul2 buat zaza rasa nak cuba nanti..pizza burger tu terliur sungguh tgk nya..
Terliur weh.. makan 1 pon cukup dah ni..
Cute2 nya pizza art ni. Nak makan pun rasa sayang. Nampak sedap & gebu. 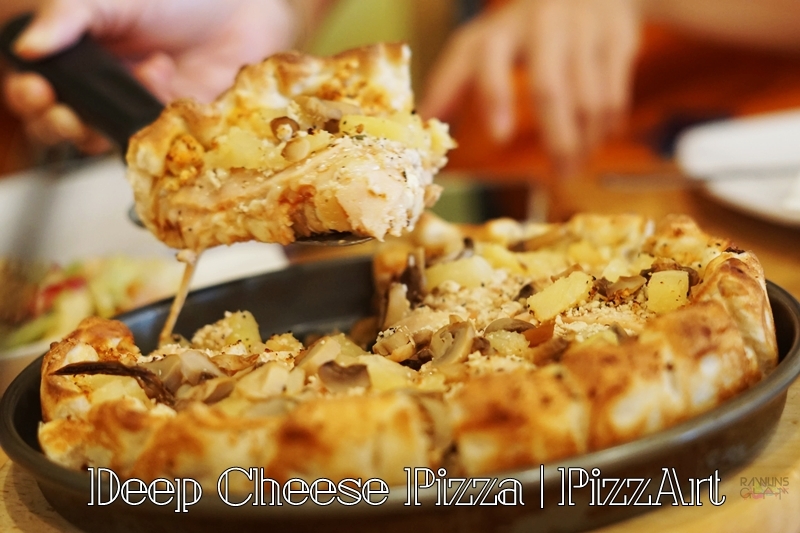 Deep cheeseA pizza looks soo delicious! Should try it someday! Tak pernah tau ada brand ni, tapi piza dia nampak lain sekali dan special sekali teringin nak rasa piza burger tu meletopppp! Hungry after reading your post! The pizza looks and taste great too. Can't wait to try more yummy Pizzaart too. attended their event once few months back and from there onward, i keep hunting their partners outlet just to fix my cheese craving... lolx. seriously the food really good and their cheese really flavorful and the 30cm promising pulled... oh my.. deeply fallen in love..